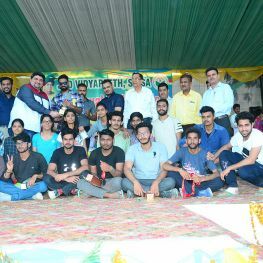 On the occasion of the birth anniversary of Dr. Ajay Singh Chautala at JCD Vidyapeeth, the 2nd day of the 14th Annual Athletic Meet was officially inaugurated by Dr. Dilbag Singh, Chairperson, Computer Science Department, Ch. Devi Lal University, Sirsa who joined as Chief Guest. On the same day, in the evening session, different competitions were organized. Chairperson of the Department of Law of Ch. Devi Lal University Sirsa, Prof. J.S. Jakhar and Prof. Ravinder Pal Singh Ahlawat, attended as special guests. On this occasion, the Chief Guest was Sh. Pradeep Sangwan, noted cricketer who was received by the Management Coordinator Er. Akash Chawla, Director Academics of JCDV, Dr.R.R.Malik, Mr. Siddharth Jhinjha, Management Executive, JCD Dental College and Principals of all constituent colleges of JCDV. Dr. R.R. Malik informed about the achievements of JCD Vidyapeeth that said that our objective is the all-round development of our students, in which such programs play an important role. In his address as the chief guest on this occasion, Dr. Dilbag Singh said that sports play an important role in our lives, so each student should make a connection to the sports in his life so that he can get better employment and success as the government also Special facilities have been provided for the students whose students should be benefited. On the same day, Prof. Ravinder Pal Ahlawat and Prof.J.S.Jakhar, in the evening session, said in their address to the participants that while the competition from the game is encouraged, physical education and skill also develop among the players. He said that presently the youth is getting away from the sport and spends more time on mobile rather than sports, which has a bad effect on our health. The games play a very important part in the life of the students, especially in the lives of the students. 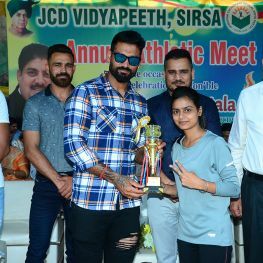 In the discus throw competition of Girls, Sharda earned the third place in Dental College. In the race for 200 meters girls, Nisha of Dental College stood First. In the Triple jump of women, Nisha of J.C.D. Dental College stood First. On the other hand, in the 400 meters race of women, Sanchi and Shivani earned the first position of J.C.D. Dental College. In the 110 meter hurdles of men, Ankush Jagga of J.C.D. Dental College got third place. In the 110 meter hurdles of women, Nisha of J.C.D. Dental College secured the second position. All the winning participants were honored with certificate and prizes by the chief guest and other guests and by the principals of all the colleges of JCD Vidyapeeth. In this program, Sports Coach and others who have been playing other than the sports officer of the JCD University, Mr. Amrik Singh Gill, made their invaluable contribution to make this work successful. On this occasion students of all the colleges, besides faculty members, officers and other dignitaries of different colleges were also present.